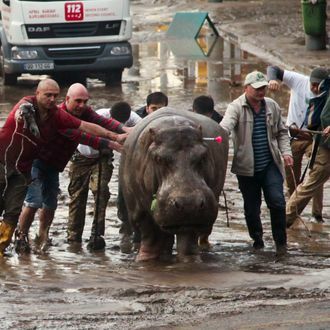 People help an escaped hippopotamus in Tbilisi, Georgia. In a nightmare for both human and beast, devastating floodwaters have inundated the city of Tbilisi, Georgia, killing at least 11 people and leading to a mass exodus of animals from the local zoo. 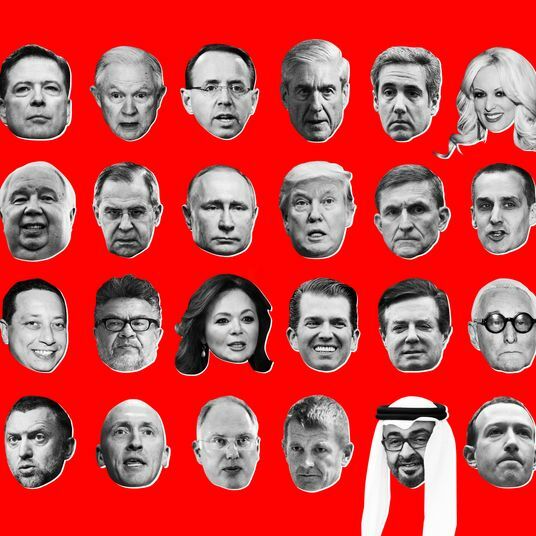 The Washington Post and CNN report that torrential overnight rains in the former Soviet republic forced the Kura River from its banks, destroying enclosures at the Tbilisi zoo and freeing or drowning at least half of its 600 animals, including tigers, lions, jaguars, wolves, bears, and a hippopotamus. Parts of the city, which is home to more than a million people, remain in lockdown as authorities try to locate and subdue the dangerous (and surely terrified) animals. Some have already been captured or killed, including a hyena that was shot by police after stalking a guard at one of the local universities. As many as three zookeepers are reportedly dead as well, including a worker who had just survived being attacked by a tiger last month. Among the biggest tragedies for the zoo is the loss of a rare white lion called Shumba. It had become one of the zoo’s biggest attractions after they paired it with a dog to keep it company, after Shumba’s mother stopped caring for him. They became friends and could be seen playing and sleeping together right outside the zoo’s main offices.